If you drive a tractor-trailer (called a "semi," or more commonly a "big truck," in the trucking world), you have to keep a log book. While some companies use paperless log books where you enter the information on a computer, it is essential for every truck driver to know how to fill out written logs. You can purchase log books acceptable to the Department of Transportation, both bound and in loose-leaf form, at most truck stops. Or your employer may provide them to you. While the log books may vary slightly, any commercially produced log book is DOT approved. Open your log book. You want to make sure you are sitting comfortably in an area where you can write and fill the forms out neatly, along with drawing lines through the graph showing your daily activities. The activity categories provided are: "Off Duty," "Sleeper," "Driving" and "On Duty (Not Driving"). Fill out the basic information at the top of the log book page at the beginning of your day. Write the date, your name and the co-driver's name, if applicable, the truck number (called a tractor) and trailer number. Include your employee number and the shipping number for your cargo along with any other information. Never leave blank areas in your log book. Begin marking your logged time at either midnight or when you begin your work after 34 or more hours off-duty (called a "restart"). Use a ruler as a straight-edge and draw a horizontal line through the graph area that corresponds to what you are doing. End at the time that you switch activities. For instance, if you slept from midnight to 5 a.m., mark a line from the beginning (midnight) to the 5 a.m. line in the space marked "Sleeper." Make changes in your status by drawing vertical lines, either up or down, to move to the box corresponding to your new duty. If you make a 15 minute pre-trip inspection, as required by law, at 5 a.m. for example, drop down to the "On Duty (Not Driving)" category and mark a line across 15 minutes. Follow the hours of service rules when working and filling out your log book. Each time you do anything note where you are on the line provided in "Remarks." These lines angle down from the duty graph and you should write the location above the line and the reason below. For instance, you might write, "Little Rock, Arkansas" and "Breakfast." You can also use highway mile markers and exit numbers or any other identifiable description of your location. Continue noting all activities immediately after they happen, stopping only when you are off duty for another restart. Use each page, in a row, in your log book as your work time continues. Never rip a page of your log book out – this will cause problems with the DOT. Record the total hours for each work day sheet. Make sure to use a calculator to avoid any errors. Sign the log sheet when you are finished. Make sure you know and follow hours of service. These regulations, enacted in 2004, dictate you may drive no more than 11 hours after spending 10 hours in a row off duty. You can spend another three hours working (but not driving) but your total time on duty can not exceed 14 hours in a 24-hour period. In addition, you can't drive more than 60 hours in seven days, or 70 hours in eight days time. Be aware of changing regulations. Keeping your log book neat and orderly presents you as a professional driver. This will reflect well on you with your company and with the DOT if your log books are inspected. There are penalties for falsifying log books. The exact penalties vary by location, but may result in fines of several hundreds of dollars and even short-term jail to long-term prison terms. 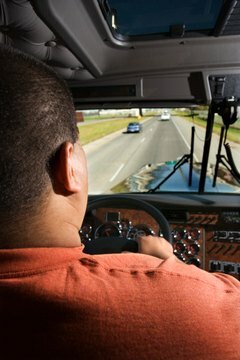 In addition, if a company forces a driver to falsify log books, the penalties are even stiffer. Lapham, Karie. "How to Do a Log Book the Right Way." , https://careertrend.com/how-8608338-do-log-book-right-way.html. 05 July 2017.